Tripwire started life as a magazine way back in 1992 and we switched to the web in 2015. 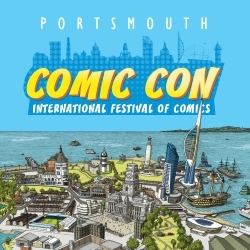 In 26 years, we have become one of the pre-eminent comics and genre publications in the UK, with fans like Oscar winner Guillermo del Toro, Weta Workshop maestro Richard Taylor, best-selling author Ian Rankin and The Simpsons and Futurama creator Matt Groening. We are looking to take things to the next level and develop our remit and our brand and to do this, we shall require a small financial boost. The funds raised would be hugely beneficial to us as it would allow us to pay contributors to the site as well as enhance the site’s software and feel. Although it’s unusual for us to ask directly for people’s assistance, we feel that this is a worthwhile endeavour as we have been such mainstays of the UK comics industry for many years. Money raised will help us to pay contributors, assist with running costs (things like upgrades and hosting) and also facilitate things like increased new originated content like videos and more interactive features. It will allow us to continue to support UK independent comics the way we have done for many years now too. We shall need the funds fairly soon as we have plans for the website we would like to put into place by the end of this year. So we are looking to conclude our campaign by the end of December 2018. Also, for a limited time, anyone who donates £20 or more will get a limited edition print with art from the likes of Walter Simonson, Sean Phillips, Shawn Martinbrough, Dave Dorman, Gene Ha, Martin Simmonds and more. Thanks for reading and thanks for your continued support.